Sometimes it’s difficult to figure out what the “theme” of a book is. A theme is the basic message an author wants you to take away from their story. Greg Mortenson feels that his book’s theme is “Education is Hope.” Explain in your own words what that message means to you. 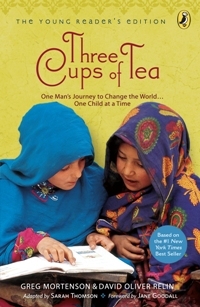 Be sure to tell us what the most important lesson you’ve learned from Three Cups of Tea is. Explain why. It’s kind of fitting, considering the events that have happened in the news this week, that groups like Al Qaeda and the events of September 11, 2001 have popped up in the book we’re reading in class. We’ve talked a lot about how religious extremists like Osama Bin Laden are the minority and that most Muslims are peace loving people, and now (at least in the book) we’ve met some Muslims who aren’t that different from us – they care about having a good life and taking care of their families – just like us. Maybe we’re starting to see that some people may have a different religion, different clothes, and live on the other side of the world, but they’re still very similar to us. Chapter 19 recounts the events of 9-11 and concludes with a speech by Muslim leader Syed Abbas at a school celebration. How did reading Syed Abba’s speech make you feel? Did you find other quotations in the book from Muslim leaders, schoolchildren, or others surprising, informative, or reassuring? Explain your answers. We read all about Greg Mortenson’s failed attempt to climb K2, getting lost in the mountains and stumbling across the poor village of Korphe, and feeling the need to help the people of that village in some way. Eventually, Greg made a decision to build a school in the tiny Pakistani village of Korphe so that the children there would have a safe place to learn. Of course, nothing is simple, and Greg has run into quite a bit of trouble trying to complete his mission. Put yourself in Greg’s shoes and try to understand how he feels when he returns to the United States with the school still not built? If Greg had tried to build a school in a poor part of the US, how would his experience have been similar or different?